Yahoo! 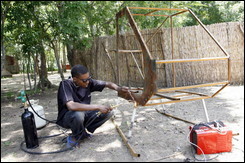 News (among other sources) carries a story from October 21st about Mubarak Muhammad Abdullahi of the Kano Plains of Nigeria who has built a working helicopter over the last 8 months using scrap aluminum and parts from a Honda Civic, an old Toyota and from the remains of a crashed Boeing 747. Mubarak is ambitious however and has embarked on a new project to build a better helicopter that will be able to make 3 hour flights. 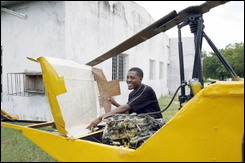 He hopes to get support for his project from the Nigeria Civil Aviation Authority (NCAA) and other Nigerian government bodies.